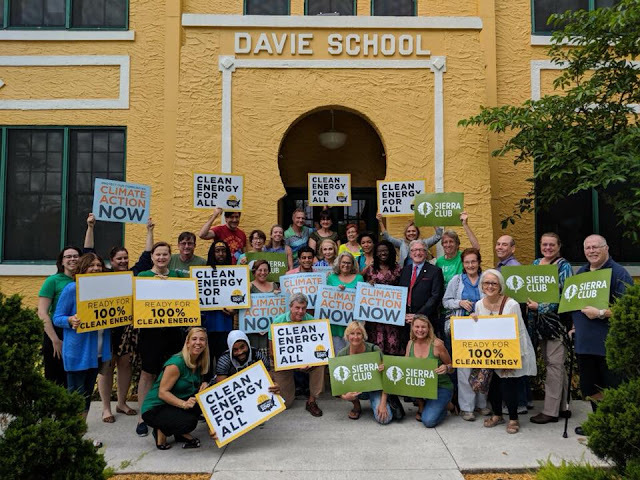 Sierra Club members showed up in force at the Old Davie Schoolhouse on Tuesday, May 15, to protest Florida Power & Light’s plans to rebuild and expand a fracked gas plant in Dania Beach. Wearing green, close to 50 Sierra Club members joined by New Florida Majority, Dania Beach residents, the Mayor of Tamarac, the Democratic Environmental Caucus of Broward County and members of the Miami Climate Alliance made their voices heard during the public portion of the site certification hearing. Dania Beach residents called out FPL for its plans to elevate the new plant by 10.5 feet. FPL cites “sea level rise” in its application even though the plant’s methane emissions are exacerbating climate change for surrounding communities. Sierra Club members and residents of Dania Beach demanded to know why FPL had not considered clean, renewable energy instead of building another fracked gas plant. Tamarac Mayor Harry Dressler spoke about the ways in which local governments and therefore taxpayers are shouldering the climate change costs of FPL's addiction to fossil fuels. The final step in the approval process will be a vote of the Power Plant Siting Board which is made up of the Governor and Cabinet members. The vote is expected to happen sometime in late August of 2018. Sierra Club members and others concerned about FPL’s plans to build another fracked gas plant that will lead to more climate change impacts should call the Governor’s office at (850) 488-7146 or email him at: rick.scott@eog.myflorida.com and demand that he vote NO on approval for the Dania Beach fracked gas plant!